One of my favorite things that we do is this: every year we celebrate our clients’ yearly anniversary of doing business with us with a personalized gift basket. Now, This is one of my favorite things because it’s a fun thing to do a little something to show our appreciation for our clients being loyal to us. That got me thinking about some different ways that you as a business owner can thank your clients and your customers. The first way that you can do it is by sending them a thank you card for their business. Now, I know there’s a lot of value in the hand-written card, and I’m not downplaying that whatsoever. But my handwriting’s terrible, so what I do is I use a service called SendOutCards. Obviously it’s not hand-written, it’s text that I put in, but here’s what’s really neat: I can put in pictures! I’ll go and I’ll find pictures of my clients, or the owners, or something that I know will really touch them, that shows that I was listening to their interests, and include it in the card. 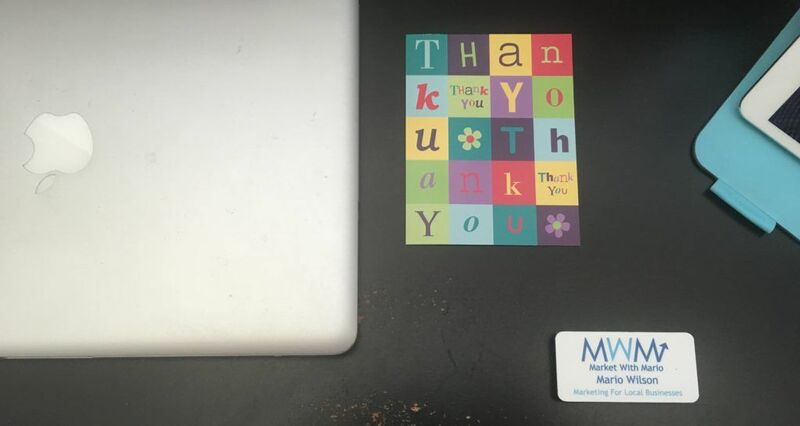 Every client of ours that comes on board will get a personalized thank you card from us. Send Out Cards is one service you can use, and Pixingo is another. And always, of course, there’s the hand-written note, if your handwriting is better than mine! Like I mentioned before, I love to do this. I use a service called Penny’s Gift Baskets. She takes your ideas and creates this amazing gift basket! Now what’s really neat is you can personalize this. If you spend time with your customers and your clients, if you have an ongoing relationship, you tend to pick up on things that they do, that they enjoy, their interests, their families, their pets, everything. You can get them items to put in this gift basket that they actually care about, and they know that you’re paying attention to what they enjoy. You can use tools like Facebook to sort of “spy” on your clients to get an idea of things they like. Look through their pictures, look at what businesses they like, look at what they’re posting, to get an idea of what they might resonate with. If you notice that they’re always checking in to the same restaurants, get them a gift card to that particular restaurant. If you see that they’re always with their pets, give them a gift card to a pet shop. You can use LinkedIn and Pinterest for this too, to see what their interests are to really personalize a gift for them. 3. Tell them you appreciate them! Finally, you want to continue to tell your customers over and over again how much you appreciate them. I equate this to a relationship, whether it’s with your spouse, or your kids—you can’t just tell them how much you appreciate them or how much you love them one time. That won’t work! It’s a continuous affirmation with your family, and it’s the same thing with your clients. You can’t just tell them as soon as you get their business, “Oh, thank you, I appreciate you so much!” and be done. You have to tell them over and over and over again. Then they’ll really and truly feel that you appreciate their business. I think we’re doing a great job providing a great service, but I also think the reason why we have so much client loyalty is because we truly tell and show that we appreciate the clients that we do have. And if you do the same in your business you’ll have loyal customers for a long time. It’s great to gain a customer, but it’s even more valuable to gain and keep a customer. These ways of saying thank you will help retain your clients for your business. What are some ways that you thank your customers?